As you can see from the image above I managed to get the LCD working, however the code I used was a modified (leaner) version of the original one. For those who have been trying to use the LCD library please note that it will not work since the LCD is connected to PIC chip through a SPI communication chip, a good choice on Microchip’s part in my opinion. What this chip does is it allows you to use fewer pins of your PIC when working with components that require many like LCDs. The modified version of the code I used is the following. RCONbits.IPEN=0;   // disable priority system. // Switch ti LCD line 1 ( sends a command to the LCD to tell it ). // RF6 is connected to RESET of expander: Hardware reset. Must be externally biased. 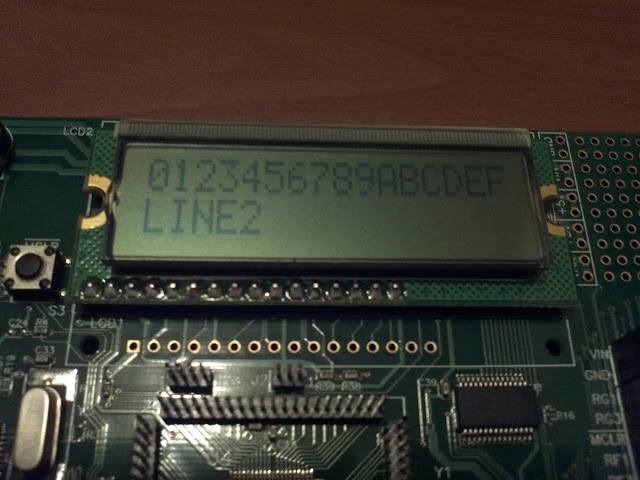 Since the LCD used SPI communication we can use the MCC18 SPI library, I will post the code as soon as it’s ready.